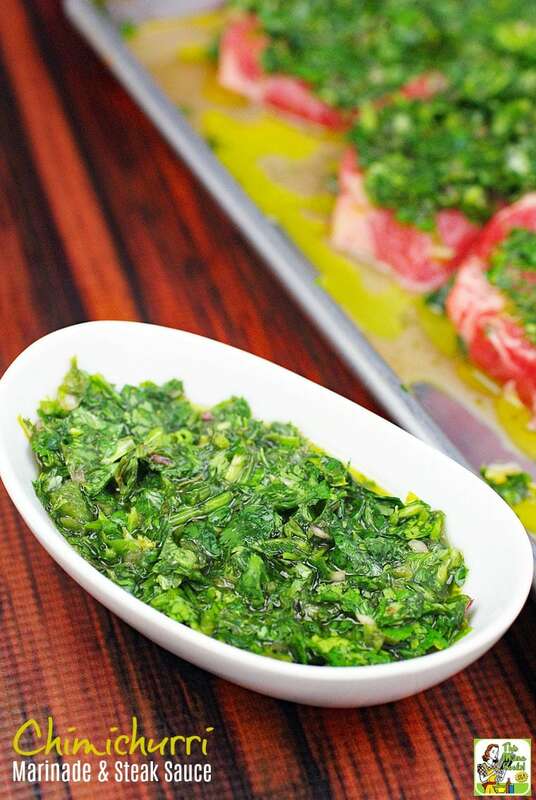 If you’ve tried Argentine chimichurri sauce at a fancy steak restaurant, you may think it’s too hard to make at home. Or maybe you think that expensive gourmet bottled sauce is the only way to go. Actually, making this recipe for chimichurri sauce is easier than you think! Plus, the nice thing about this sauce is that it serves two purposes. Usually chimichurri sauce is used to flavor grilled steak. But you can also use chimichurri sauce to marinate your steaks as well. 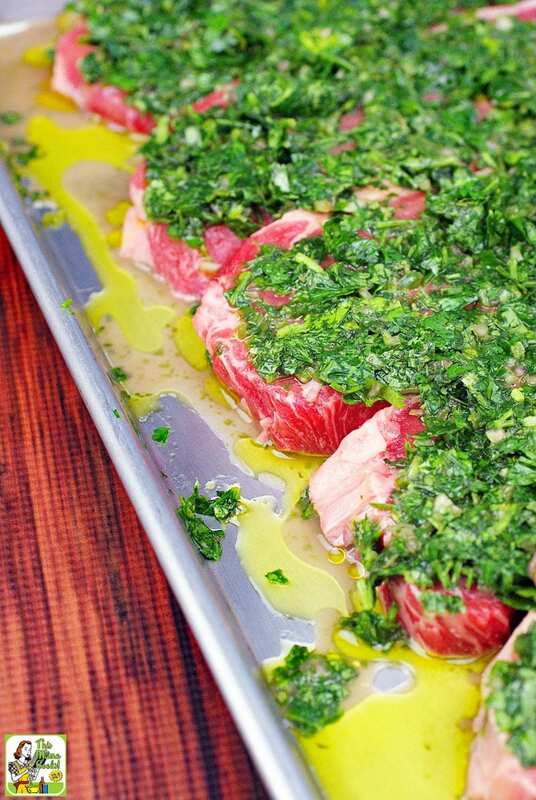 Your kids may be skeptical about using the best chimichurri sauce recipe on their steak. Have them give it a try – you may just win them over! My daughter wouldn’t try chimichurri sauce at first because it was green, then gave it a big thumbs up. When making this chimichurri steak sauce recipe, use an electric food chopper to mince the parsley, cilantro, oregano, shallots, and jalapeno. It’s a lot to chop! One cup of parsley is about one bunch. Two cups of cilantro is about two bunches. And 1/3 cup of fresh oregano was the entire herb packet. Great how that worked out! Remember to put some chimichurri sauce aside for serving before using the rest for marinating. Don’t eat the leftover chimichurri marinade as it has bacteria from the raw steak! I used lean strip steak for this steak chimichurri recipe as that’s what I had in the freezer. (Manager’s special, what can I say?) If you can’t find strip steak, skirt, sirloin tip cut, hanger, flatiron or flank steak would work well, too. Just make sure to tenderize whatever steak you use with a steak tenderizing tool. 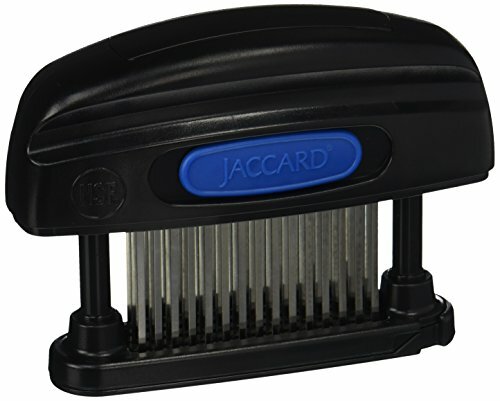 I swear by the Jaccard Meat Tenderizer Tool. Using the tenderizer helps the meat absorb the marinade and prevents the meat from curling up during grilling. I’ve seen another chimichurri steak sauce recipe using basil, celery, and chili flakes. So experiment at will! If you can’t find a red jalapeno, use a green one. No big whoop. This chimichurri marinade recipe is a great way to use up leftover parsley and cilantro from other recipes. Don’t you hate when leftover parsley and cilantro goes bad in your veggie drawer because you don’t have anything to do with it? Freeze leftover chimichurri sauce in ice cube trays for later use. However, make sure you throw out the leftover chimichurri marinade. You don’t want to ingest anything that came in contact with raw meat. Yuck! Combine vinegar, salt, garlic, shallot, chile, cilantro, parsley, and oregano in a bowl. Using a fork, whisk in olive oil. Set aside half of the chimichurri to serve as a sauce with the cooked steak. Keep refrigerated until serving time. Treat the steak with a meat tenderizing tool. Place the steak in a glass or ceramic dish. Or place it in a gallon sized Ziplock baggie. Toss with remaining chimichurri marinade. Cover and chill the steak for at least 3 hours or overnight. 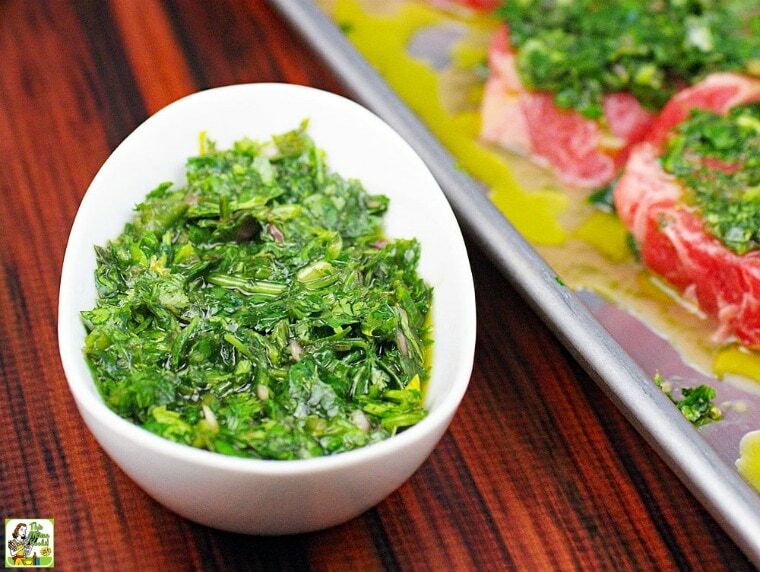 Remove meat from chimichurri marinade. (Toss used marinade.) 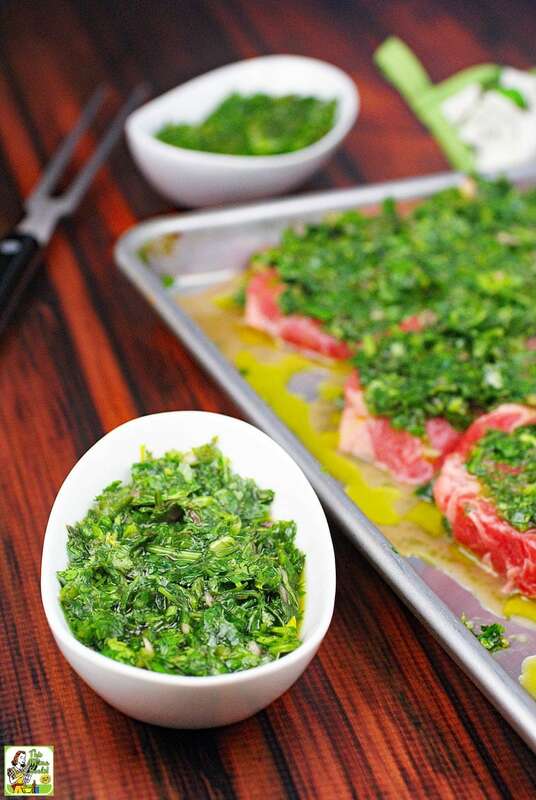 Before grilling, scrape off solids from the chimichurri marinade. Blot steak dry with a paper towel. Cook until steak is medium-rare. Remove from grill and transfer steak to a cutting board. Cover with foil and let rest for 5 to 10 minutes. Slice steak thinly against the grain and serve with the reserved chimichurri sauce. Serving size: About 1/2 to 3/4 pound of steak per person. Originally posted on September 9, 2014. Updated with new pictures and information. Previous post Try this Tequila-Glazed Grilled Chicken Thighs recipe this weekend! This chimichurri looks pretty darn delicious. Gorgeous chimi! I love pairing steaks with chimichurri sauce. I’ve never thought to marinade them with it though, brilliant! It turned out deliciously well. Mmmmm…. I love steak, so this is right up my alley! YUM!!! The flavors of chimichurri are always a sure-fire win and I’ll bet this would make any steak taste fantastic. I always am just plain Jane with grilled steaks but I love the thought of adding chimichurri to it like you did here! I love chimichurri with steak. looks incredible, and I love all the tips.